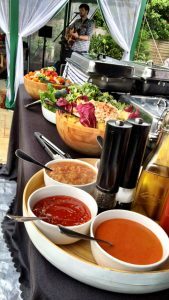 When it comes to hiring caterers for your event, you don’t just want to settle. With Hog Roast Wales, there’s no need to, as we have so many options for your party food that you won’t believe it! Of course, we can provide you with a sumptuous hog roast or spit-roasted bird or a different kind of animal, but if you want additional food or even alternative food, we have various menus for you to look through. Nevertheless, we go the extra mile by helping you to create your own bespoke menu if you prefer instead; you can mix and match menus or suggest other foods to us and we will do our utmost to incorporate them into your menu. It’s your party, whatever the occasion, so we believe it should also be your choice of food. If you fancy posh nosh, we can devise a menu with several courses including handmade canapés and waiter-served drinks, as well as a starter, main and dessert. If you’re after a barbecue in the sunshine, we can cook burgers and sausages in your back garden. Plus if any of your guests are on a special diet, we can cater for them too, as long as we know in advance. It’s one of our most popular attributes that our customers love about us, nobody is left out! Hog Roast Wales clearly loves to provide variety for our customers but at the end of the day, we also really do love to cook a lovely hog roast from scratch. We think they’re the best hog roasts in town, wherever in Wales or further afield that you need catering. Give us a try – you won’t be disappointed.